The hotel offers a restaurant and a coffee shop/café. A bar/lounge is on site where guests can unwind with a drink. Public areas are equipped with complimentary wireless Internet access. This business-friendly hotel also offers a fitness centre, multilingual staff and concierge services. Complimentary self-parking is available on-site. Amansari Hotel Nusajaya is a smoke-free property. Situated in Gelang Patah, this hotel is 1.9 mi (3.1 km) from Nusajaya Centre and 2.7 mi (4.3 km) from Eco Botanic at EcoWorld Gallery. Legoland Malaysia and Puteri Harbour are also within 9 mi (15 km). Along with a restaurant, this smoke-free hotel has a fitness centre and a bar/lounge. Free WiFi in public areas and free self parking are also provided. Other amenities include a coffee shop/café, concierge services and laundry facilities. All 322 rooms offer free WiFi, room service (during limited hours) and LED TVs with cable channels. Free bottled water, hairdryers and showers are among the other amenities that guests will find. Limited housekeeping is available. 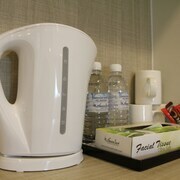 Amansari Hotel Nusajaya offers 322 forms of air-conditioned accommodation with complimentary bottles of water and a hairdryer. LED televisions come with cable channels. Bathrooms include a shower, a bidet and complimentary toiletries. This Gelang Patah hotel provides complimentary wireless Internet access. Housekeeping is provided on a limited basis. Buffet breakfasts are available for a surcharge and are served each morning between 6:30 AM and 10:00 AM. Amansari – This restaurant specialises in Asian cuisine and serves breakfast, lunch and dinner. Open daily.